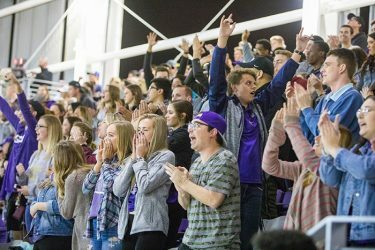 It is becoming a common occurrence for Grand Canyon University sports fans to walk into a new athletics venue on campus and ooh and aah about its look, feel and amenities. After all, five have opened in the last 18 months – two in the last week. 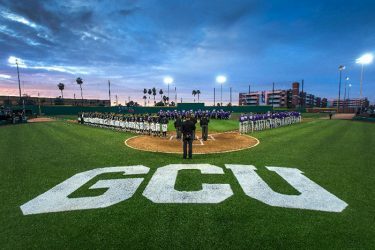 But the official opening of Brazell Field at GCU Ballpark on Friday night produced the strongest reaction yet. Like GCU Arena, the predecessor to the new homes for soccer, beach volleyball, tennis, softball and now baseball, this has all the trappings of a transformative facility that will become known near and far. A heartbreaking 3-2 loss to TCU, the No. 7 team in the country, couldn’t quiet the notion that there will be many more moments of ecstasy than agony here. 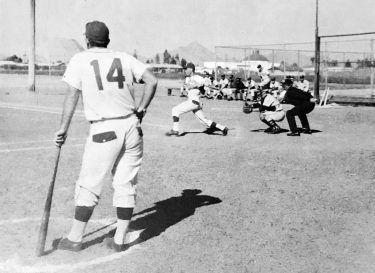 Alumni from the early days of Grand Canyon baseball in the 1950s could scarcely believe that they were standing in the same place they called “the dust bowl.” When the field first was constructed, it was composed entirely of dirt – no grass anywhere. The only greenery on it was the stickers on its edges and the weeds in the outfield. 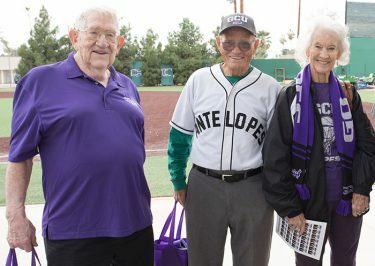 Fred Hawkins (left) and Pete Gorraiz and his wife, Bertha, enjoyed the pregame alumni party, and then they enjoyed the new stadium even more. Players from the 1980s and ’90s, an era that included four NAIA championships, were equally stunned by its appearance. The program’s most notable alumnus, Tim Salmon, was visiting campus for the first time in two years. His reaction as he got his first glimpse of the stadium’s various features was priceless. Tim Salmon throws out the first pitch. And that was before he walked up the stairs and saw the huge new grandstand enveloping the classic field, which was preserved through the nine-month construction process. “I’m so impressed,” he said later, after throwing out the ceremonial first pitch and sitting in the TV booth for an inning. “It’s just exciting. When I came here and played, I thought it was pretty amazing. We thought it was a gorgeous stadium back then – it was the nicest structure on campus. 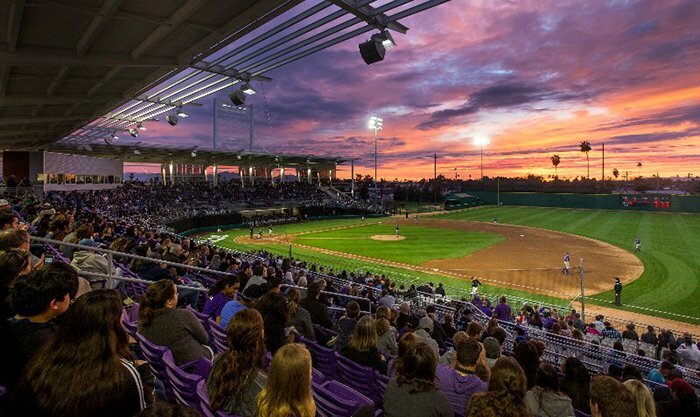 Two prominent players of more recent GCU vintage, Garrison Schwartz and Paul Panaccione, took time away from their spring training preparations to see the opener. Schwartz will be heading to the Atlanta Braves’ minor league camp in Orlando, Fla., in a few days, and Panaccione is ready to do the same at the Washington Nationals’ camp in West Palm Beach, Fla. 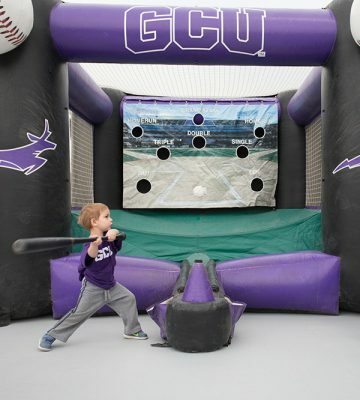 They likened GCU Ballpark to those well-maintained spring training facilities – but said it’s a whole lot better than many minor league parks. The crowd of 3,749, most of them GCU students, definitely got into it. And what was it like for GCU players performing in front of a record crowd of 3,749? The fans undoubtedly will, too, for several reasons. For one thing, admission is free. That’s a nice break for a family looking for a fun, inexpensive outing. There’s a kid zone and berm seating down the right-field line and plenty of concessions – even purple nachos. And, if they want, aspiring players can stand right behind the batting cages as collegians take their hacks. 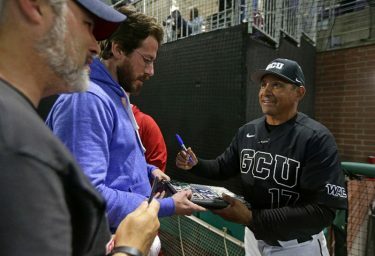 The postgame fireworks show had ended, and the GCU players likewise were putting aside their disappointment as they joined Stankiewicz in dutifully signing autographs, as promised, for fans at tables set up in front of their dugout. There’s plenty for kids to do at the new stadium besides watch the game. There will be more visitors like TCU, more big games, more big moments. This season’s home schedule includes Washington State (coming up Tuesday night), Arizona, Penn State, Kansas and New Mexico, and the Lopes are favored to win the Western Athletic Conference – a feat that, if achieved, would earn them their first trip to the NCAA tournament. From dust bowl to field of dreams. There’s nothing common about it at all.